Bravery. What is bravery? The Merriam-Webster dictionary states bravery is “the quality or state of having or showing mental or moral strength to face danger, fear or difficulty.” So often children arrive at Oregon Dream Ponies having only experienced ponies from their interactions with video, books and their own imagination. This connection with the ponies has typically been of a static nature. The horses and ponies were two-dimensional, and contact was visual and three-dimensional. Here at the ranch children are met with a very real three-dimensional pony just their size but still so much bigger than anything they have experienced to date. And, these ponies move! Naturally the children have a bit of fear come into their little bodies along with all the excitement visible with widened eyes and slight cold shivers. Their eyes look up to me for support. I assure them I am there to keep them safe – that’s my job. As we interact and develop a level of trust, the children move forward with the activities I ask of them even though they still have a sense of fear or difficulty around what they are about to do. The delicate balance of developing their trust and asking them to try difficult or scary tasks supports children in practicing bravery. We celebrate with great grander every time a child demonstrates bravery no matter how small. The cumulative result from numerous small brave acts creates a compounding effect for children to build character in all parts of their lives. 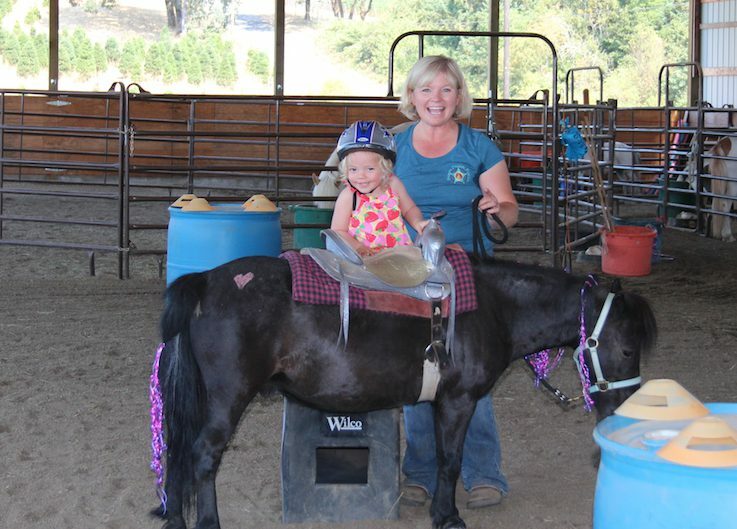 Parents share that their children tried something new after practicing being brave with their pony. Another parent shared that her daughter went to ride her bike (which she was learning to ride without training wheels) with a new sense of determination continuing to try and try and try until she could ride her bike. In the picture above, 3-year old Isabelle is surprised when her bravery of balancing in the stirrup on the side of the saddle midair is a success. She is amazed that she is balancing on her own on the side of her pony. Yes, I am right there just in case she was to start to wobble but my hands are not touching her. The joy simply radiates from her face! Children delight me as they are so eager to interact in this world. I am thrilled ponies can support them in practicing bravery that can transfer to all parts of their life.